If you have an enquiry regarding our products and services please contact us via contact form or at below stated email address. We will contact you back as soon as possible. If you want to learn more about our organization go to About Us. WE PROVIDE DATA. UNIQUE DATA. LEARN MORE AND JOIN MARKET LEADERS WHO ALREADY CREATE VALUE BASED ON OUR SERVICES. CE-Traffic uses Floating Car Data technology to provide sophisticated data analysis for real-time and predictive traffic and mobility information in Czech Republic, Poland and Slovakia. Everyday we analyse over 25 mln kilometers of anonymous GPS tracking data which combined with knowledge about local drivers behaviour creates the most accurate and granular traffic data available in the region that enhances and enables dynamic navigation and location-based services, as well as transportation systems. CE-Traffic computes geodemographic statistics out of anonymous signaling data from mobile network operators. We are experts in analysing location-based big data and turning billions of records into meaningful and actionable spatio-temporal information. We provide unique knowledge on macro scale behaviour of customers, neighborhoods, societies. After successful launch of the PREMIUM RDS-TMC in Poland last year, CE-Traffic expands the service to Slovakia, creating the first Traffic Message Channel in this country. “We are pleased that our TMC service is now available also to drivers in Slovakia. RDS-TMC works in many Western European countries for many years already. In the last two years the TMC service launched in many countries of Eastern Europe as well. By combining our traffic data of current traffic flow generated by unique technology of floating cars enriched with data of road works and traffic restrictions of the Slovak administration highways portal and other public sources we have created the optimal TMC service. Thanks to the cooperation with Fun Radio, the leading Slovak Radio with appropriate national broadcast network, we broadcast the traffic content on the territory of Slovakia. With our first customer – Garmin – may now begin Slovak drivers to use this simple, practical and affordable channel for receiving traffic information,” says Jiří Novobilský, CEO of CE-Traffic. CE-Traffic PREMIUM RDS-TMC is the state-of-the-art TMC solution which offers drivers in Poland and Slovakia access to unique traffic data. Information about traffic congestions and delays is generated using Floating Car Data technology based on fleet of vehicles that generates daily over 25 mln kilometers of anonymous GPS tracking data. Fused with journalistic road events monitored by our local Traffic Information Centers and smartly filtered using our know-how about local drivers behavior our Premium RDS-TMC is the best available TMC service in Central and Eastern Europe. MotoGP Grand Prix in Brno. What have we learnt about our Big Data systems? CE-Traffic offers location-based Big Data services: Real-time traffic and Geodemography. The first one uses Floating Car Data technology to analyze over 25 million kilometers of anomymous GPS tracking data daily to generate high-quality real-time and predictive traffic information. Our second system uses anonymous signaling data from mobile network operators to provide unique macro-scale geodemographic statistics (or Location Insight Service). 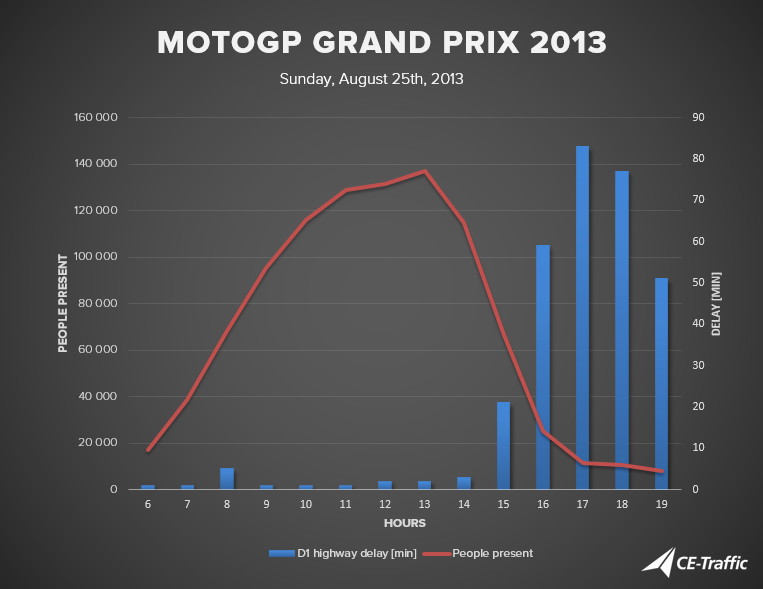 We decided to use the opportunity of MotoGPS Grand Prix – premier championship of motorcycle road racing in Brno – to investigate quality and correlation of our two independent systems. Our Geodemography system was monitoring number of people present in the area of the Masaryk Circuit, and Floating Car Data technology allowed us to generate precise traffic information on D1 highway in the radius of 5km away from the circuit. This example shows that the correlation of the two systems in very high. Using Ce-Traffic historical data about similar events around the Central and Eastern Europe gives new possibilities in analysis of mass behavior during large events which is extremely important e.g. for crisis scenario modelling. INTENS Corporations s.r.o. launched a new personalized traffic service for both professionals and the general public on www.mojedopravni.info. The service provides real-time traffic information in a personalized way. Users can set-up their own routes e.g. to work, to home, to gym etc. and they will receive information by email or SMS about current traffic conditions as often as they wish. Until first half of May 2013 the service is available on testing web doprava.intens.cz. There are 14 days of free usage after registration. Feedback would be very appreciated by the creators. There is also a demo account where is not needed to create an account in order to test the service. We find it important to promote intelligent transportation technologies and solutions therefore CE-Traffic became a sponsor of Polish ITS Congress 2013. The event is held for the 6th time by the ITS Polska Association and it will address significant challenges that lies ahead of public sector as well as the whole Polish market. We would like to invite all guests interested in innovative real-time traffic data technologies for presentation of Tomasz Przeździęk – Board Member of CE-Traffic for his presentation: “Use of Floating Car Data in urban Intelligent Transportation Systems. Prague case study”, which will demonstrate implementation of CE-Traffic data in Prague traffic management center. Feel free to talk us also next to our stand where we will show interesting traffic visualizations and data analysis. This year Polish ITS Congress will take place under special circumstances, as the implementation of intelligent transportation systems is part of the first EU operational programme dedicated to ITS as well as the largest public contract in the ITS sector in Poland – national traffic management system, designed to cover all the motorways, express roads and selected national roads, has just started. We look forward to argumentative discussions with leading industry experts in Poland. The event will be held at Mariott Hotel, Warsaw, on 13-14 May 2013. Learn more on PKITS website.